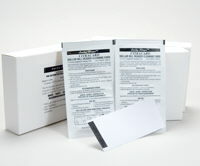 These presaturated, disposable cleaning cards are designed to safely and effectively remove all dirt, magnetic oxides and other contaminants from all types of concealed magnetic heads, photo and optic sensors on all types of reader mechanisms. We’ve tried many cleaning cards in the past and this is by far the best! This alcohol-free card effectively cleans the internal components of your bill acceptor without damaging its belts and rollers. It is so effective that we use it to aid us in all of our repairs. You’ll be amazed at the amount of grime this card removes! We are so sure that you’ll love this cleaning card as much as we do that we’re offering you a money-back guarantee. (2) Insert the cleaning card into your bill acceptor with the black strip entering first. The card will be accepted by the bill acceptor and then rejected. Repeat this process for a total of 3 times. This will effectively loosen any caked-on dirt. (3) Insert the card as you did in step 2, but this time once the card is half way in, hold onto the card for a second and then release. This will cause the belts and rollers to momentarily spin on top of the card to remove the loosened dirt. Repeat this process for a total of 3 times. (4) Allow the cleaning card to dry, and insert the dry card into your bill acceptor 3 times to dry any moisture left by the cleaning process.